Remember that little tiny pile of cut up 9-patches I showed you a couple of days ago? I couldn't believe it, but all those patches covered a huge area on my floor. I must have spent a good hour sorting them and laying them out the way I wanted. 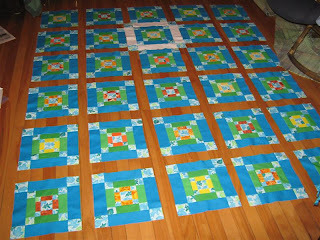 Crispy's prediction that my missing three 9 patches would re-appear kind of came true... Three 9-patches make 12 little squares, which turns out to be one row of the quilt, so, the quilt is now one row shorter, 15 instead of 16 rows. 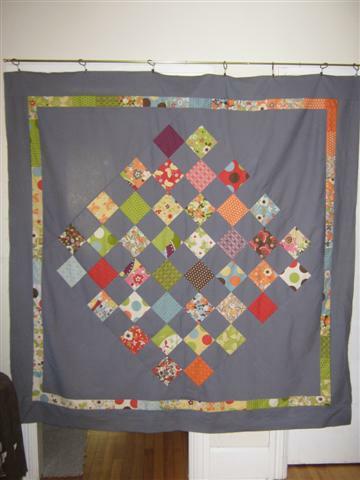 The size still works out, since it's a double sized quilt and I can always play with the borders a bit. So no extra piecing for me! Then I spent an intense time pinning rows, running out of pins, sewing rows, pinning some more rows etc. I'm about 2/3 done, with all but one row pinned, and if I get home at a decent time tonight, at least all the rows if not the whole top will be finished - very exciting! 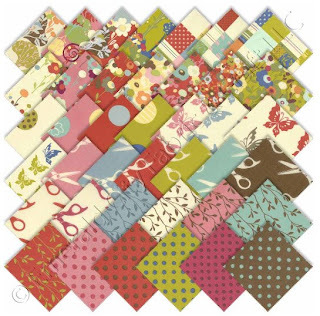 Those will be my first two choices, though I think I can do better with my fabric stash, so rather than rush, I decided to put the little quilt on hold for a bit. Here's my makeshift design wall, a towel stuck on a dresser drawer, so that I don't loose my arrangement of the green squares. I've definitely caught the charm bug! Because I couldn't wait for my charm packs to arrive, I decided to use some of my own fabrics (that's a new concept, isn't it??? Actually using up stash fabric?) 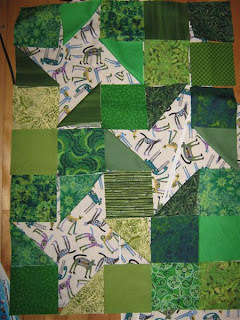 and cut a bunch of 5"x5" squares from my green collection. 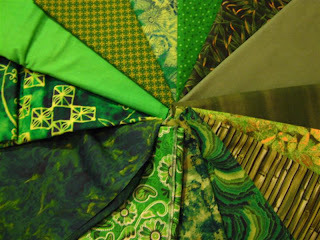 I really like green, maybe it comes from living in cities with too much concrete for most of my life, so I've been buying green fabrics here and there without a plan. And then my progress came to an abrupt stop, because I couldn't make up my mind what to use for the stars... here are some options, I'd appreciate any opinions! 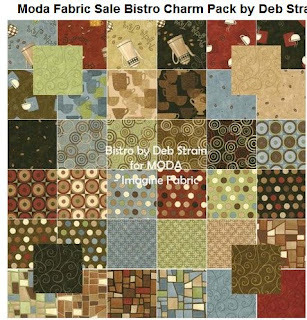 And in very sad news, I got a message from one of the etsy sellers that the Bistro line of the Moda charm packs she was offering was sold out, booohooohoo!!! 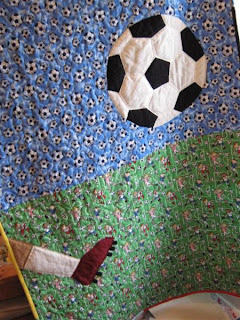 I checked my blog-watch this morning, checking out all the quilting happenings since yesterday afternoon and found this beautiful babyquilt on FilmInTheFridge. 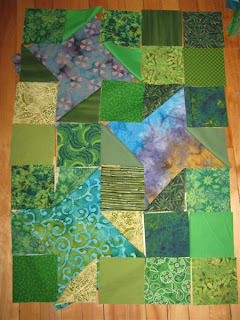 Now, I always thought plain square patchwork is boring, but boy have I been proven wrong! 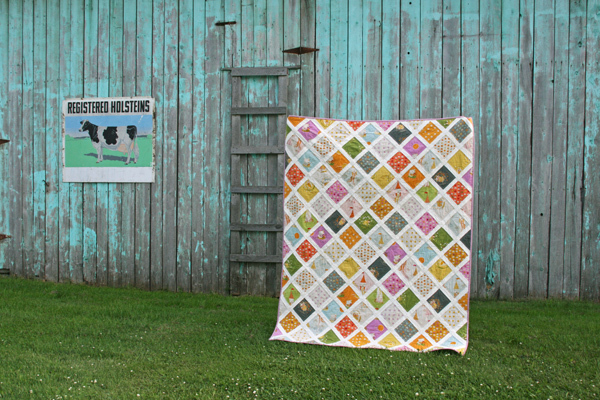 This is such a cute quilt, and I figured it's partly because of the fabric/colour choices. That got me thinking that matching fabrics is a lot easier with a charm pack, where the colours are already matched, lo and behold. So, following a comment by Wendy (?) 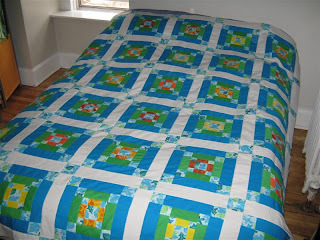 of I love baby quilts, I checked out the etsy.com shop. You know where this is going! 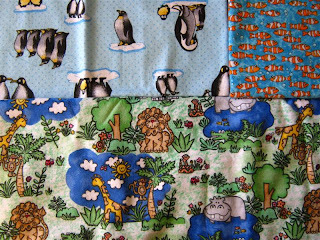 Here's the Wonderland fabric that Ashley (FilmInTheFridge) used, it looked so cute in the finished quilt. I really really like this one, makes me think of a picnic, probably because of the plaid prints and the flowers. Maybe the dots make me think of pollen and allergies = summer, too? :) Haha, weird association. 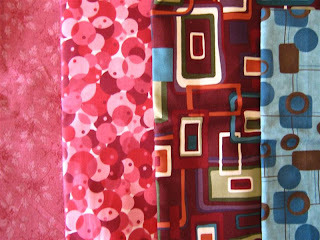 And you know what, I keep blogging about my fabric-buying-guilt, but really, getting these fabrics makes me really happy, and I pull them out once in a while just to look at them and enjoy them all over again, until I use them up in a quilt (which I will KEEP and look at over and over and over again!). 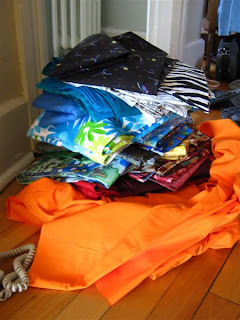 So really, I've decided not to feel guilty for spending a fortune on fabrics anymore! I'll enjoy it while I can (i.e. don't run out of money). 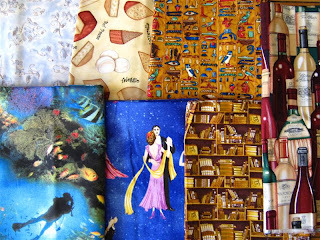 Wishing you much guilt-free fabric shopping! Go crazy! 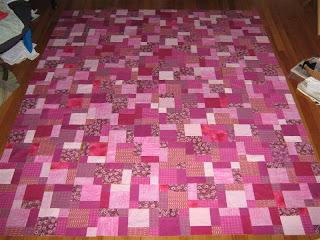 Once I had finished the Spring Quilt top, I felt the urge to work on the pink quilt again. I had let it rest for many many weeks, trying to decide what to do and work up the guts to do it. 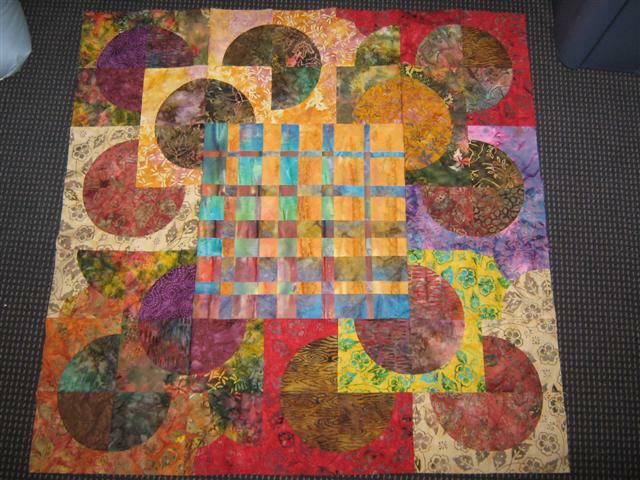 In the end, I cut all the 9-patches and will make an entire disappearing 9-patch quilt. This will also allow me to fill in the gaps from the three mysteriously missing (or just miscounted) blocks, as I have enough pieces to make up disappearing 9-patches, but not full 9-patches. 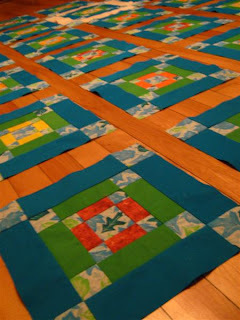 Now I'm going to have to clear enough floor space to lay out the patches in a pattern I like. That'll be a big task! Spring Quilt Top Done - Yay! I'm really happy with how it turned out, especially with the different block centers. Now I will put a couple of borders around it and think about a backing and the quilting. 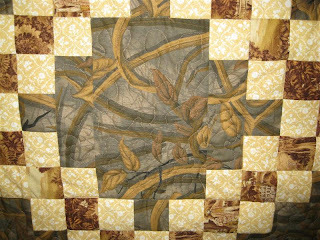 Wow, I did not expect so many comments on my bloggers quilt festival post! Thanks to all who visited and also thanks for the wonderful and lovely comments! After a couple of weeks of illness and being away without internet connection, I'm finally back on the scene. 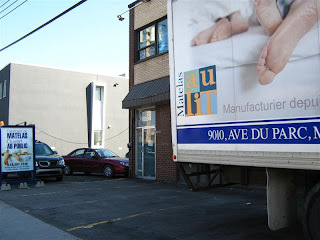 Turns out it's a matress store that will do the quilting part of making a quilt on a large machine, but they neither sell quilt fabrics nor quilts. Oh well, it was an adventure. In Kingston, I found a lovely but very very expensive fabric store. Fabrics started at 15.99$/m, phew. 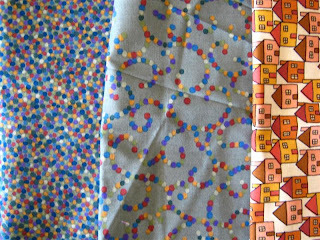 I bought .5 m of an absolutely gorgeous fabrics and a couple of fat quarters. They'll be used for something special, for sure. 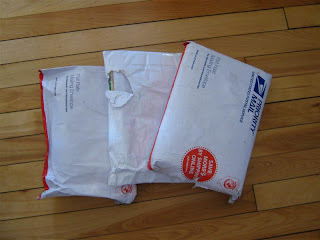 When I got home, I had a great surprise waiting: all three fabric orders from the US had arrived and were peaking out of my stuffed mailbox - I was so happy no one had taken them, because they sat there for a few days according to my neighbour (he'd left me a note that the mail man was very worried about my parcels getting wet...). Here are the rest of my treasures, including the purchases from Montreal and Kingston. These are all flanelettes, the one on the bottom was a bargain for 2.99$/m, so I bought a couple of meters for babyquilt backings. The two on the right are the expensive ones from Kingston, but I just love the colours (especially the Moda fabric on the far right), and I could really tell the difference in quality when I ironed the fabrics. 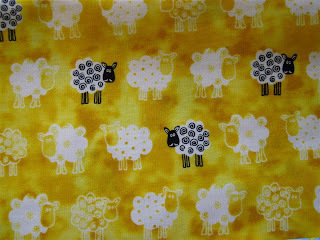 Incidentally though, this quilt store sold one of the fabrics I bought at a bargain shop here in town for 3.99$/m, except there it cost 16.99$/m. So high price is not always high quality or vice versa. Lesson learned. 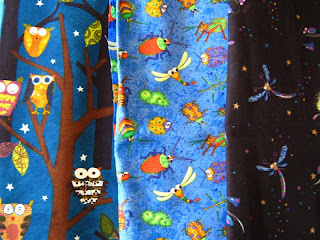 Oh, I lied, the bugs are from Kingston (my friend picked the fabric), and the glow-bugs are from Montreal. I love love love the cranky owls! 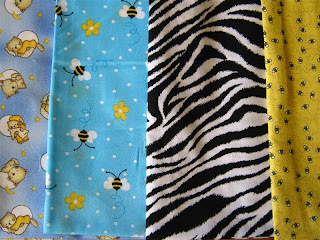 And lots of new fabrics means lots of washing and ironing to do. In fact, I stopped ironing this afternoon when I got a blister. 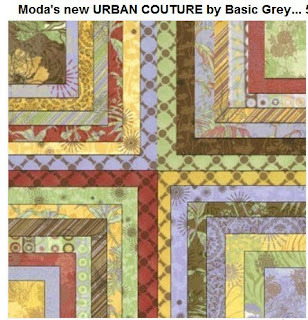 I've decided to partake in the Bloggers Quilt Festival that Park City Girl is hosting on her blog. 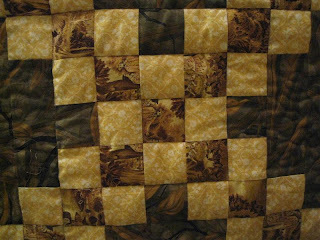 I had to pick one of my finished quilts and tell the story about it, and it's too bad that a lot of my quilts are in progress and I'm so new at quilting that I don't have that many done yet. 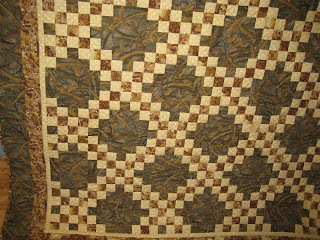 I picked my first full size quilt, the Late Fall Quilt, so named because of the colours, which reminded me of that time of year after all the beautiful leaves have fallen and the grass has turned that yellowish-brown. 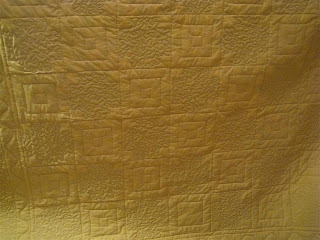 The story behind this quilt is this: I made it as part of an evening class taught by two very talented quilters. 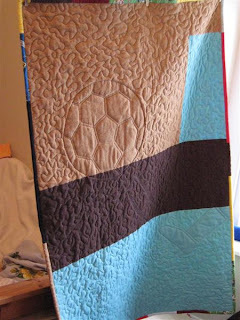 I had never really quilted before but have always been a bit crafty, so quilting really intrigued me. 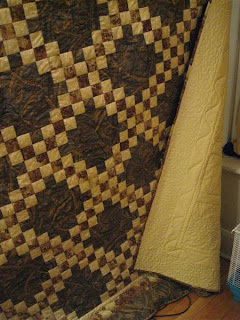 I bought some fabrics that kind of matched from the clearance section of a local fabric store as I didn't want to spend a fortune on a potentially disastrous piece of work :) However, since I'm part perfectionist and a logical thinker, I really took to quilting. 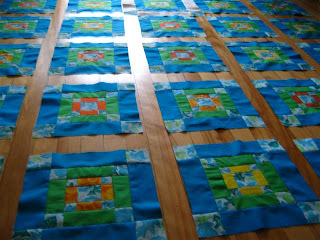 The trickiest part was choosing the colours, as I just couldn't imagine what they would look like in the final pattern. 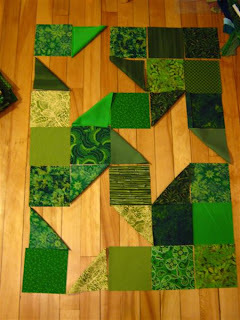 In fact, I couldn't imagine until the quilt top was finished!! The whole class made a double Irish chain in the 10 week course. I usually don't go with the flow, so of course I decided to reverse the pattern to have the dark colour in the center and the lighter ones in the chain. 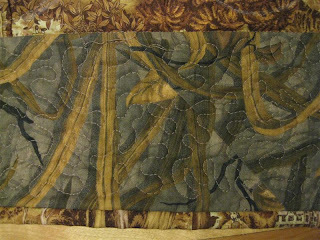 On top of that, the leafy fabric was my favourite and I wanted to have large sections of it on the quilt. 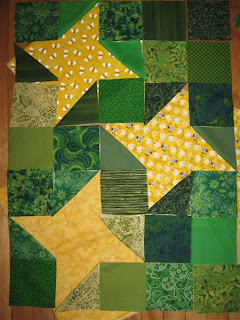 I started sewing away, not being that happy with my colour choices all throughout the piecing process, and threatening to give it away, but lo and behold, when that top came together, I fell irreversably in love with the quilt and quilting in general. 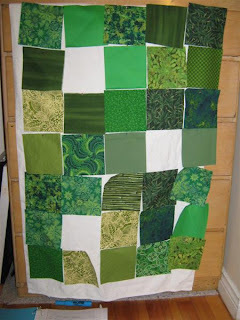 I ended up giving the quilt away after all, as a Christmas gift to my mom, but only because I liked it so much, not because I needed to get rid of it! 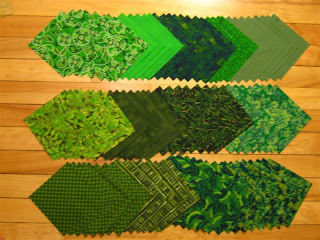 And now it's 7 months later and I'm working on my 10th quilt, coming up with my own pattern variations and getting better and better at choosing fabrics and being confident that they'll turn into a great quilt. That in fact is my favourite part of quilting: all those random pieces of fabric transforming into a beautiful finished product! Amazing. The blogging/quilting community has given me so much inspiration over the months, that I think it's a really great idea to bring many of us together in an online quilt festival! 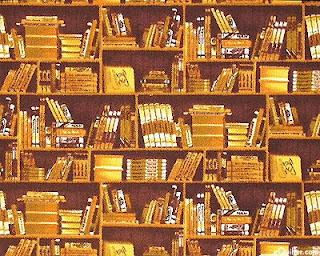 It's wonderful to have so many like-minded crafty people out there! 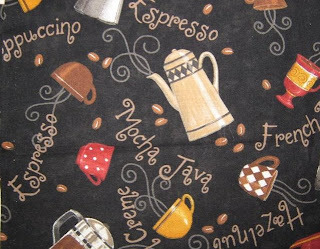 My desperate fabric search and the comments I received sent me off into uncharted territory: the realm of online fabric shopping. It's going to be my downfall. Not only did I already have an acknowledged addition to fabric shopping in person, now I can also spend wads of money online, boohoo!! I managed to place orders totalling just over 100$US today. This is *NOT GOOD*! 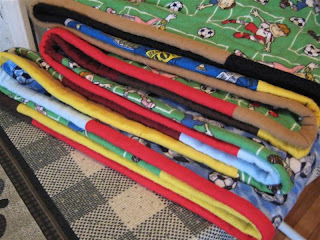 and I couldn't get enough other fabric together to make it worth the order anyway. 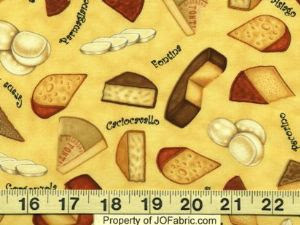 So I started another Google search and come up with a thread on a discussion forum where someone else, *just last month* was looking for cheese fabric. One fabric that was suggested to her was perfect and I checked the link, but it's out of stock. I contacted the vendor and it's out of print. 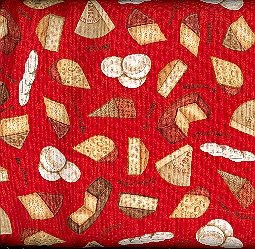 Next I started a search on eBay and found the red background cheese fabric again, but also available on cream background. 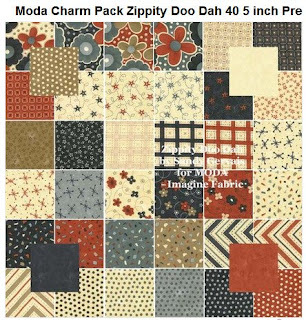 I contacted the vendor, and while I waited for a response, I found another site that sells fat quarters, amongst them the cheese on cream background. Bingo. 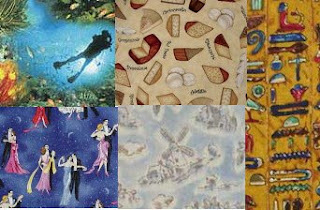 The final sign that this was the store to buy at was that I found ballroom-dancing-couple fabric like I had imagined it! Yippie yeah! 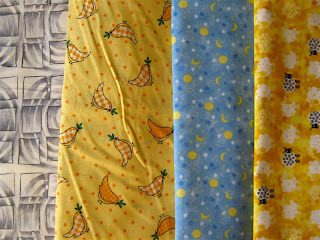 And actually, now that I have both fabrics on this post, I think they're the same... the colour/quality on the images is so different, I thought I had a different fabric entirely. Double yippie yeah! 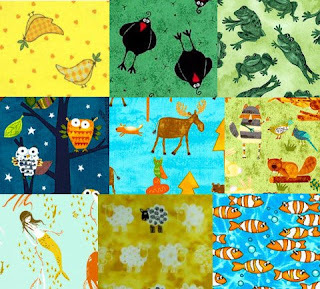 ... and while I searched for the character quilt fabrics, I came across all these extremely cute prints, sigh. Aren't they adorable? 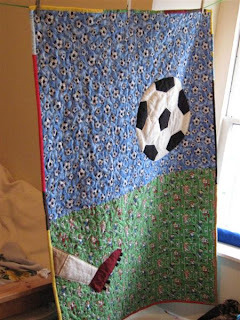 I want to make some baby quilts like the ones by Alissa. 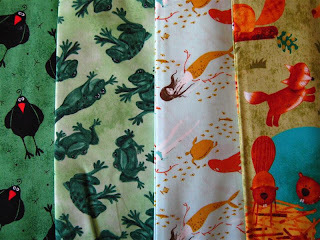 The fish are flanelette, everything else is 100% cotton. The owls and crows are my two favourites, I think. Looking at these prints now, I can easily forget how much I spent (most of it was the cost for shipping internationally, anyway...). tropical beaches - I want something with blue water, sand, a palm tree, maybe a beach chair or towel. Around here, all I get are temperate beaches with lighthouses. It has to be tropical though. I've come across a couple of prints online but didn't like the style very much. divers - with SCUBA tank, snorkel, fins, swimming under water would be nice but not necessary. If you know where I could buy any of these and could let me know I'd be very very grateful. 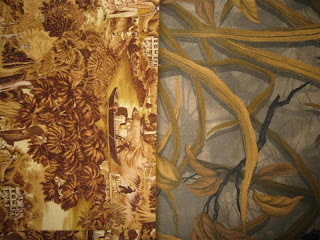 Also, if any of you have a piece of suitable fabric, I would love to swap them - maybe I have some fabric that you would like? 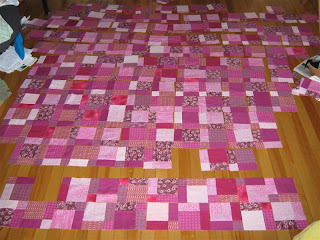 I only need a small piece (depends on the scale of the print) thanks to the quilt pattern I'm making (based on this quilt). So maybe anything from 5x5" to 7x7" (for larger prints). I'm starting to be desperate as I'm missing some of the main themes for the character quilt and would like to get started. My friend is planning on moving across the Atlantic this year and it would be a wonderful going-away gift. Haha, I just realized that it's pretty mean of me to ask for help right AFTER I blog about how generous and helpful quilters are *grins*. 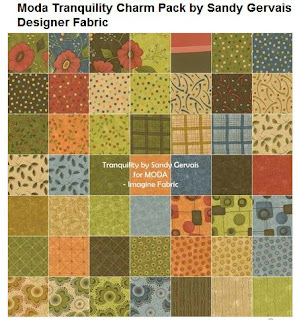 I guess Ginny's generosity gave me the idea, really, that I might be able to find and trade some of these difficult-to-get fabrics. 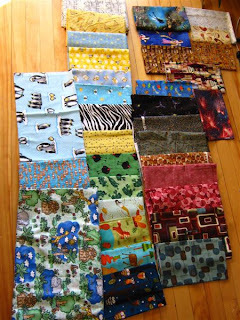 I hope that someone out there has a patch of those fabrics left and would like to trade!!!! 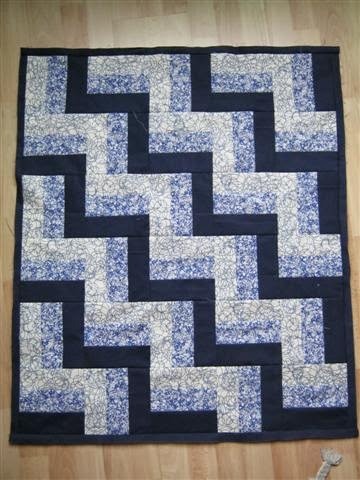 I'm already envisioning how awesome a quilt would be that has such a story of a quest and outside-help behind it; a quilt where I can say: "This fabric came from XY in Connecticut, and this one from Ontario, and this one from France." Ah, just day-dreaming! 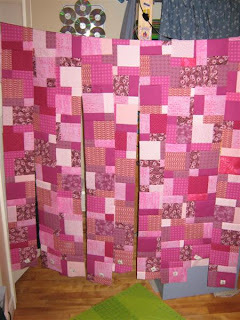 After I left a comment on her blog, she offered to send me some pieces of the fabric, that she could spare. They just arrived in the mail and they're perfect! 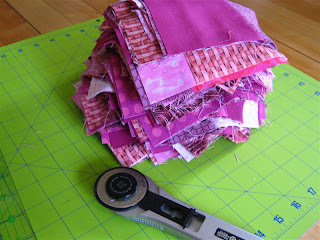 Quilters are just so generous! Put the last stitch into the binding last night! Very multi-coloured binding. 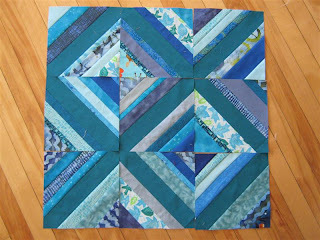 See the piece of blue heavy construction-zone fabric from the Vampire Quilt? 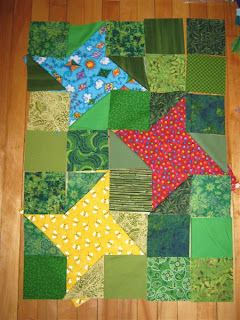 Spring Quilt Is A Go!